A few hours after the Tree of Life shooting, we clung to each other — singing, praying, crying — at the Beth Israel Center in Madison, WI. 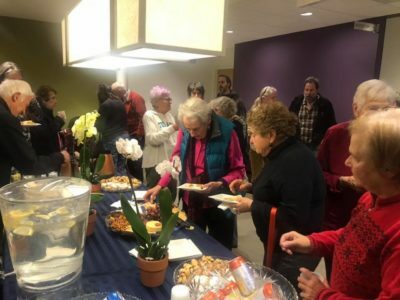 Family members, old and new friends, and synagogue goers — most of them elders, just like the people murdered in Pittsburgh while praying, gathered for a Miriam’s Well reading preceded by a Havdalah service, a 10-minute Saturday evening ritual to close the Sabbath and welcome the new week. But with the pain we carried from the worst anti-semitic attack in U.S. history, the braided Havdalah candle, the only light in the dark sanctuary, took on new, and unfortunately for us (a people targeted throughout history for annihilation) old meaning. Later that night, my friend Mary Ellen, who was among us, wrote me, “I keep thinking about the Mr. Rogers quote about what can we do when bad things happen to feel better. He said ‘Look for the helpers”’ He might have meant the first responders, but I think it’s for all healers and folks who create. Maybe he should have said ‘Look for the Miriams. '” Given that the shooting happened in Fred Rogers’ neighborhood, this is all the more appropriate. I see Miriam as one who feeds her people’s bodies and souls; all around me, I see many Miriams. Our long-time friend Sue not only hosted us and prepared a beautiful spread of desserts from the novel (rugalah, lemon bars, carrot cake and more), but as regularly as most people breathe, she serves her community, from making food for mourners, to bravely heading off to Shabbat services just minutes after she heard of the shooting. 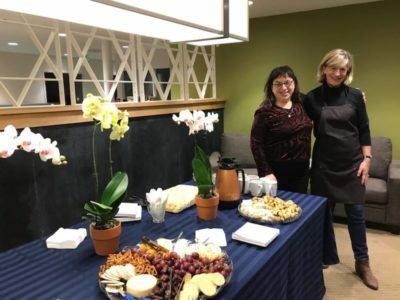 Marty, our administrative director at our local Jewish synagogue, brings great presence, calm, and love to wherever task she does and room she enters. My sister-in-law Karen spends several weekends each month taking care of our mother-in-law, baking her favorite pie with her, making stews and inviting us to come eat too. Kelley sings for people across the country, lending her voice and being to many benefits, embodying one of the songs we co-wrote, “You Gotta Be the Vessel.” My daughter Natalie, who fiercely supports people under attack, whether because they’re of color, trans, or suffering from mental illness, posted this on Facebook after the attacks: “My heart aches with you. But even through my grief, I am HERE for you. May this horrific event unify us as a community and make us stronger!” I could go on for not just inches of text, but yards and even miles about all the Miriams in plain sight. 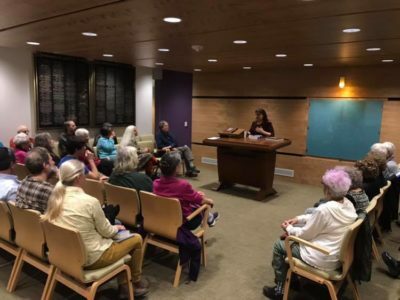 Our communities themselves can also enact Miriam or Mary or Lakshmi or other symbol of Tikkun Olam — rebuilding the broken world — through coming together in vigil, action, witnessing, and change-making. Moving forward as a people, a nation, a world requires all of us to find our innate Miriams from whatever our traditions: Jewish, Muslim, Christian, Hindu, Buddhist, spiritual, religious, or communal. WWJD is one light to follow, and there are many more beings of light, mythic and/or historic, long gone or right here among us. People have an amazing capacity to come together in song, prayer, and tears, but also, afterwards, in keeping on keeping on. Within minutes of the Havdalah service ending, I started reading from Miriam’s Well, and we began laughing. The heightened moment and this audience’s visceral understanding of Miriam as well as the New York City subway system, the 1965 blackout, and other nuances of history, amplified everyone’s responses. Life calls on us to come together, make something greater than the sum of our seemingly separate selves, and together make our way toward the light: peace, justice, respect, homecoming. Healing may be mysterious, but it rarely happens by accident. Look for the Miriams, whoever she is to or within you, and make of your life your own braided candle to light and hold high. 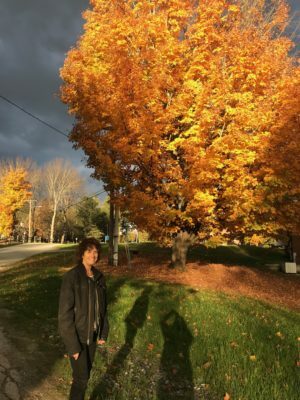 One of the wonders of this world are mountains of maples at the peak of fall foliage, and I was lucky enough to dwell among recently at the Power of Words conference at Goddard College. The big picture mind-blowing expanses are all around, from a distance golden variegated hazes that upon closer range become crazy quilts of red, rust, orange, yellow, and green. 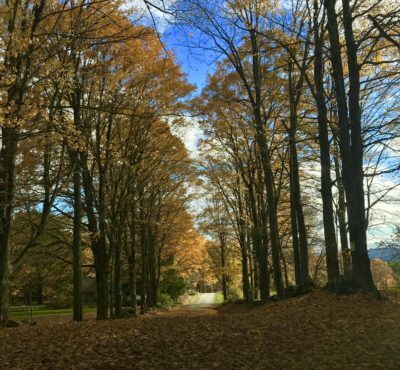 But what really grabbed my heart was the more narrow and up close light in action of the trees and sky, especially when driving up and down curvy and lilting country roads. 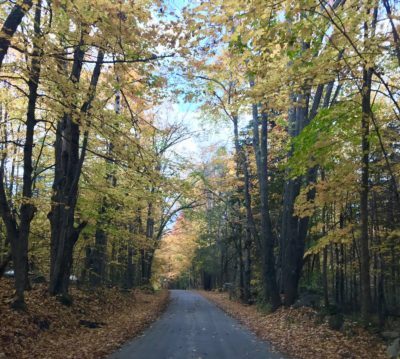 The aptly named Bliss Road, near Montpelier, Vermont, is one of those, but so is John Fowler Road, just east of Plainfield, and several other roads that led me up mountain sides and across stretches of brilliance near Marshfield. I followed color and light through dizzying beauty that kept eclipsing itself after days of rain and clouds that showed a more color-saturated side of fall. Heading up one mountain and turning down a long road, supposedly a dead end although I didn’t reach the end of it, I lost the road to the leaves. It was Bliss Road no matter where I went, particularly on paths I walked throughout central Vermont. Coming home, I encountered this urgent and heart-breaking update of what many of us knew already but now see in stark contrast: “U.N. Says Climate Genocide is Coming. It’s Worse Than That.” It makes my jaunt through the ancient glories of maple tree nirvana seem like pure escapism, which, to some extent, it was. Also reading the New York Times article “Major Climate Describes a Strong Risk of Crisis as Early as 2040,” brought me back to how endangered they and we are as well as how illuminated everything is. There’s plenty to do on a personal, local, national, and global scale, and while the articles I cited share some of the big-picture needs and dangers, back home on the small scale, I’m realizing how I can no longer be silent when I encounter climate change deniers, figuring — as I did in the past — that eventually they’ll “get it,” because while they and all of us will, in horrendous ways that multiple human and more-than-human species suffering beyond what many of us imagine, it’s clearly past time to speak out. So I’m saying here that if you also love traversing blissful paths or roads — wherever that is for you — and want to keep marveling and moving through this beautiful life; if you love your or others’ kids and grandkids; if you believe in the sanctity of life, then let’s have these hard conversations, draw on real science and deep love of each other and life. Whatever we can do for the big picture (writing congress people, joining and contributing to groups, supporting initiatives such as carbon taxes and other ways to make sure cooler heads and temps prevails) and for the intimate picture of our daily lives (reducing our carbon footprint, conserving water, diving into the hard dialogues with family or friends who deny what’s happening), we need to do for our endangered and illuminated lives. Long live Bliss Road, and may we be wise and strong enough to keep walking it. This weekend, I had the honor of being part of the Voices of Freedom Festival, celebrating the Brown vs. Board of Education supreme court decision that ended “separate but equal” policies in public schools and beyond. It was a joy to hear the music of Kelley Hunt, Isaac Cates and the Ordained, Maria the Mexican, and Injunuity, and to read with fellow poets David Baumgardner, Tava Miller, and Ashanti Spears. Here’s the poem I wrote for the occasion, held in downtown Topeka, Kansas. sipping lukewarm coffee on folding chairs. orange juice, and remind the children to take their homework. surrounded by weeds and broken beer bottles. to turn supposed equality into walkaday freedom. all the secret lashes that separate us into a lesser people. then find the courage to sing while the healing waters flow.